It’s not something we spend much time thinking about. You toast one another, you ‘cheers’, you clink glasses, and then the rest is (often forgotten) history. No drinking session starts without the mandatory clink of the glasses and exhilarating shout of ‘cheers’. How many times have your friends reprimanded you for proceeding to drink without doing the ritualistic ‘cheers’? And then sheepishly, you nod and enthusiastically clink your glass with everybody else’s. But do you know the reason behind this drinking ritual that has become an essential thing to social drinking today? For thousands of years, human beings in every corner of the globe have enjoyed coming together to celebrate, eat, drink and spent time with one another. As per the most popular legend, this tradition began long, long ago, clinking beer glasses was pretty common in taverns and during feasts in the ancient Europe. Clinking glasses so that some of the liquid spilled out into the other person’s glass was a way of proving you had not poisoned your comrade’s drink. Drunken brawls and personal enmities were not uncommon in those days where warriors, noblemen, courtiers sat down for an evening of revelry. So clinking glasses and spilling your drink into the other’s meant you were not trying to kill them. However, there is no evidence of this practice in history. Another popular reason behind this is a bit more scientific. The sound of clinking of the glasses is supposed to heighten the pleasure of drinking by adding to one more sense i.e. the sense of hearing. Taste alcohol with their tongue. See alcohol with their eyes. Smell alcohol with their nose. Feel alcohol when it enters the blood stream. Won’t they want to hear alcohol? That’s why they clink. In the process of submitting oneself to alcohol, it makes sense to feel its presence with all the senses. Am I right? Alcohol, especially wine, is best enjoyed when all the sense are involved – taking in the aroma of the spirit, watching the bubble rise up in the glass, and swirling the velvety liquid inside your mouth. Add to it the pleasant jingle of wine glasses and you are set for the evening. 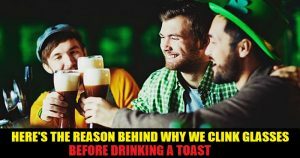 So now you know why we clink our glasses in a collective gesture of brotherhood, go ahead and show off this knowledge the next time you go out drinking.